VISALIA – A Girl Scout holds the world record for cookie sales on a single day, and the local council is hoping an upcoming event will help them capture another record for America’s favorite campfire treat. Girl Scouts of Central California South invites the community to join in the attempt to break the Guinness World Record for the amount of s’mores made at the same time. This Record Breaking S’mores event will be held from 6-7:30 p.m. on Friday, Aug. 10, 2018 at Mooney Grove Park, 27000 S. Mooney Blvd. in Visalia. Jordan King, spokesperson for the Girl Scout council, said the current record of 566 s’mores is held by the troops of Metroparks Toledo Council in Toledo, Ohio. There are about 11,000 Girl Scouts in the Central California South region which encompasses Tulare, Fresno, Madera, Kern and Kings counties. King said they chose Visalia because of its central location in the area. The competition starts promptly at 6:30 p.m. Participants will be given a three-second official countdown to begin to make their s’more. After an official counter witnesses each s’more, attendees may enjoy this time honored campfire treat (a half graham cracker with chocolate and a marshmallow, roasted for at least three seconds). All ages are welcome to attend this event and anyone over the age of 2 is welcome to participate. Girl Scout representatives will also be on site for interested girls and their families to learn more about the organization. In order to accommodate enough flame for hundreds of people to safely roast marshmallows, King said the Girl Scouts will be using a combination of fire pits, barbecues and tin platters with charcoal with about six to eight people per fire. Admission for this event is $3 for anyone who is not a Girl Scout. Admission for a Girl Scout is $5 and includes admission for an adult chaperone as well as a Girl Scout patch. The registration deadline is Tuesday, Aug. 7 at 5 p.m. At the parking entrance there is a $6 parking fee; carpooling is recommended for families. Participants interested in attending must wear closed toe shoes and must be pre-registered for the event. Online registration can be found on the Girl Scouts of Central California South web site at girlscoutsccs.org/en/events-repository/2018/girl_scout_s_s_mores.html. For those interested in tuning in live, follow the Girl Scouts of Central California South official Facebook page. 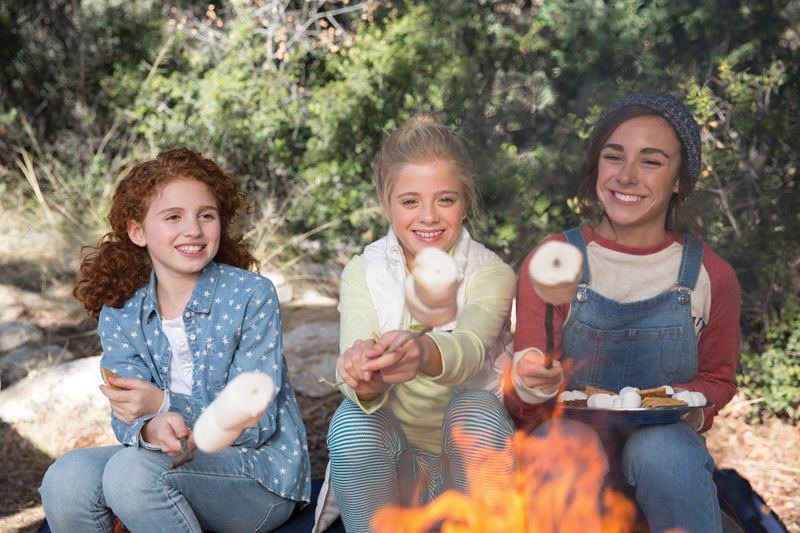 While many historical groups may have had ideas of roasted marshmallow, chocolate and graham crackers as a sweet snack, the first official recipe for a s’more came out in the 1927 Girl Scout guidebook “Tramping and Trailing with the Girl Scouts.” Originally intended to feed 16 hungry Girl Scouts, the recipe, which was later credited to a Girl Scout troop leader named Loretta Scott Crew, calls for 16 graham crackers, eight bars of plain chocolate and 16 marshmallows. Next, it says to toast the marshmallows to a “crispy, gooey state.” Then, put the marshmallow on top of a chocolate bar and in between two graham crackers to get a “Some More.” It’s unclear when the name was shortened to simply “s’more,” but various Girl Scout publications kept referring to the treat as “Some More” until at least 1971.